I worked with Joe for two years at the San Francisco Examiner. Though he worked from his Texas home, he was the senior critic in charge of major films while I handled the independent releases and foreign films. He has literally been at the movie game since before I was born, reviewing In the Heat of the Night for his high school paper in 1967 (he still counts that film among his personal favorites). I learned a lot from him, and now everyone else can too. I'm definitely biased when it comes to Joe's work, and I even provided a quote for his book jacket cover, so readers can take this review with a grain of salt. 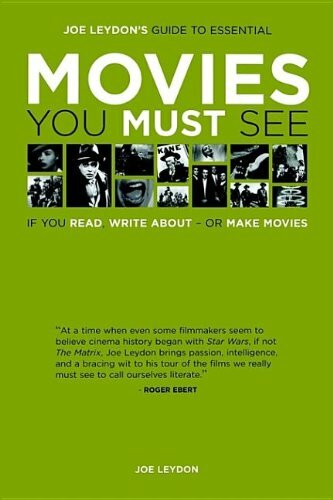 Even so, I thoroughly enjoyed "Joe Leydon's Guide to Essential Movies You Must See If You Read, Write About or Make Movies," (Michael Wiese Productions, $24.95) and will not think twice about recommending it to anyone who asks. My quote reads: "Joe Leydon's breezy prose takes the 'school' out of film school and makes looking at these classics fun � which is as it should be." I meant it, and I'm not sure how much further I can go. I can, however, tell you about the book structure itself. Joe's aim is to provide a basic grammar for film people, talking mostly about the most influential and/or the most copied movies in history. For example, anyone who reviewed Zhang Yimou's recent Hero should have known that it copied the structure of Akira Kurosawa's Rashomon, as did Quentin Tarantino's Jackie Brown, Tom Tykwer's Run Lola Run and many others. Rashomon is here in a chapter called "Foreign Influences," along with Open City, Seven Samurai, The 400 Blows and Day for Night. Each entry provides a full-length review, written in Joe's eminently readable style, plus "specs," "subjects for further research," i.e. three films that have been influenced by the film in question, plus a "lesson for filmmakers," which usually tells the story of a working filmmaker and what he or she learned in this capacity. Strangely enough, I'm still learning from Joe. Even after writing about films professionally for eight years, this book contains a film that I've never heard of, a war film called Guadalcanal Diary. I guess this kind of work is never done.